(Broomfield, Colorado) – August 15, 2018 – Phonesuite, a leading provider of communications solutions for the hotel industry for more than 25 years, announces the release of upgraded Voiceware 3.0 software, the next iteration in its leading IP-PBX hotel management platform. This major release represents Phonesuite’s commitment toward developing innovative tools that help hotels function more efficiently and profitably through cloud-based technology delivery. 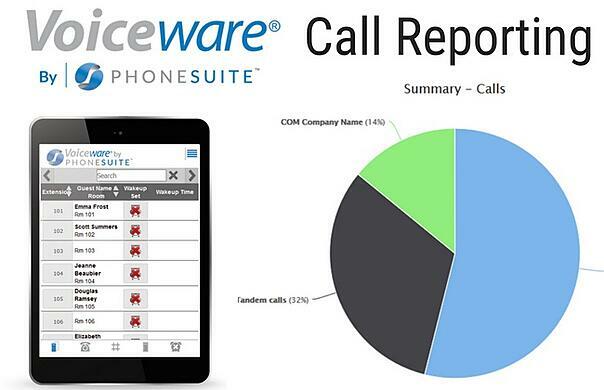 A significant feature of Phonesuite’s Voiceware 3.0 software platform is cloud-based call reporting. This tool provides hotel managers using Voiceware with up-to-the-minute call data, such as usage and staff metrics. Hotel ownership groups also gain the ability to view data across multiple properties they manage from a single, secure location. Other enhancements include upgrades to improve efficiency and security, as well as new features to aid in setup and installation of the Voiceware platform. “With Voiceware 3.0, Phonesuite continues to shift toward cloud-based delivery of important hotel technologies that are feature-rich, easy to install, and affordable,” said Phonesuite CEO Frank Melville. “In addition to new feature sets, Voiceware 3.0 wraps our browser-based reporting system that allows system usage and staff metrics tracking at one property or any group of properties – all from a single pane of glass”.